The living room has been getting a gradual face-lift, and while we haven’t gone so far as to buy new sofas (a major purchase off my growing apartment wish list), the addition of a new rug, curtains, potted succulents, and some sea fan art have helped re-vamp this room. The throw pillows on the sofas have been mismatched since we moved in (last November), and while this has bugged me endlessly, I hadn’t gotten around to replacing them… until now! I’d been looking for throw pillows, but since they run anywhere from $30 (on the low end) to $100 (on the high end… well, MY high end) I couldn’t commit! It started feeling like a big purchase, and I didn’t want to make the wrong decision. Finally, one of the mismatched throw pillow covers ripped, and that was pretty much the straw that broke the camel’s back. 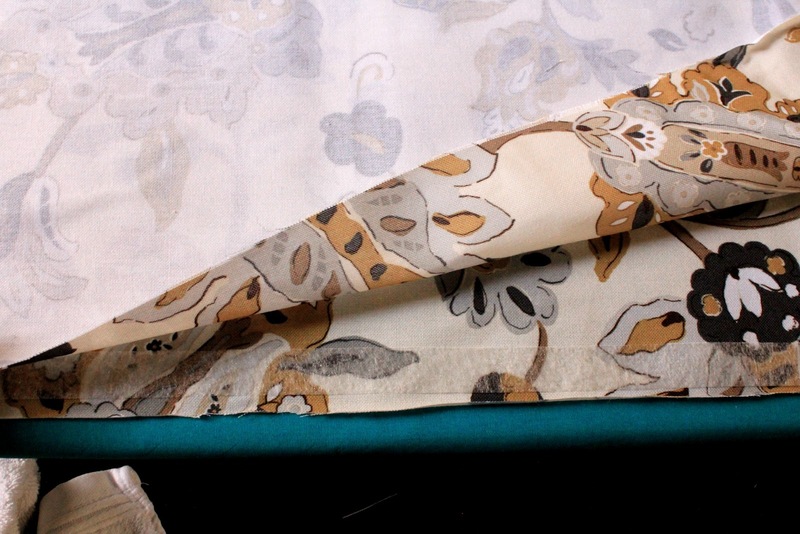 Hallelujah – a good excuse to get some new (matching) pillow covers! 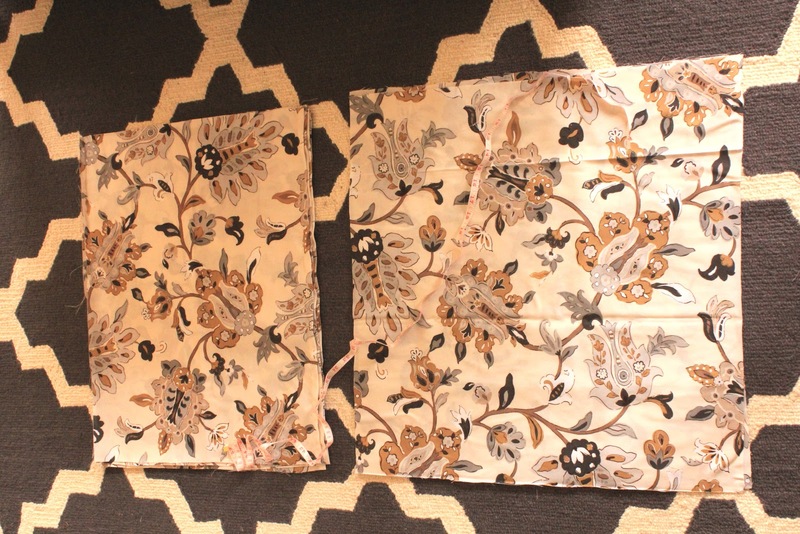 Since I’ve been such a commitment-phobe over buying throw pillows, I decided that I’d make them – a pretty aggressive decision since I do not know how to sew – I don’t even own a sewing machine. I thought to myslef, how hard can it be?? Famous last words, right? Wrong! 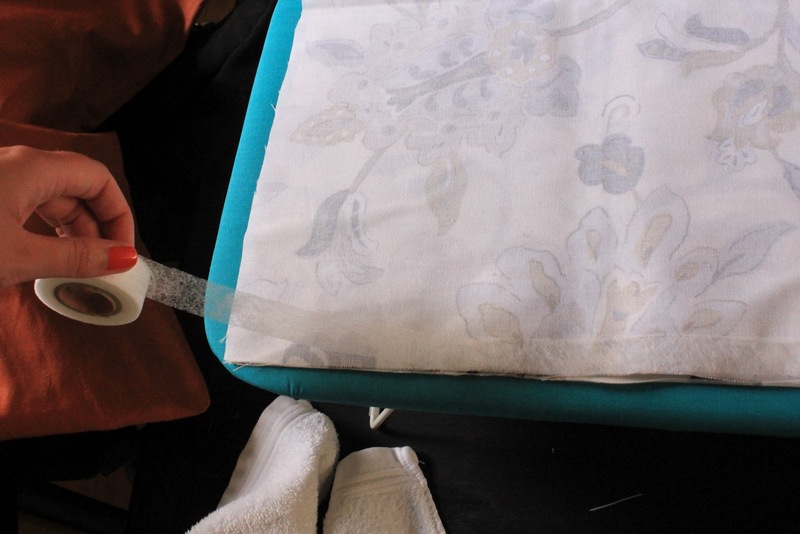 If you have a hot iron, you can make a throw pillow – I promise. Read on for my crafty tutorial! I am admittedly frugal – always looking for a way to save a few dollars, even though I like nice things. 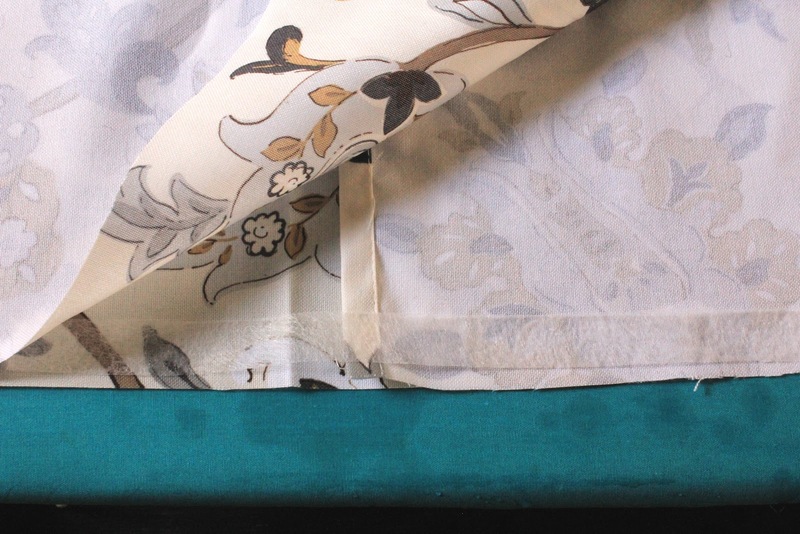 Interior fabrics that have a good weight AND an attractive pattern can get pricey pretty quickly. 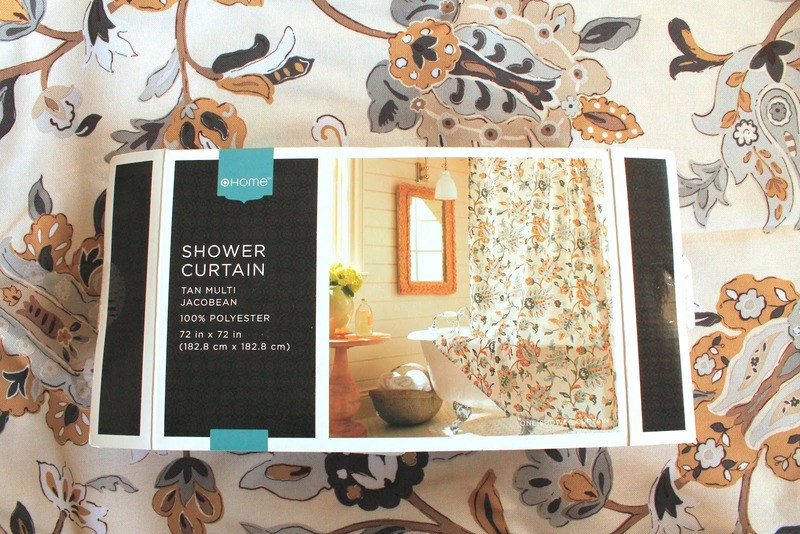 Enter my solution – the shower curtain. I was at Target, when I stumbled upon this shower curtain – it measures 6’x6′ which means I have plenty of fabric to mess up a few times, and at $20, you can’t beat it! This pattern in particular picks up all the colors in the rest of the room – blues, golds, and grays, on a creamy background – just what I was looking for! I told my best friend that I bought a shower curtain to make pillows and she laughed so hard. Little did she know what a genius I was… after showing her the finished product, she’s not laughing anymore. Since these pillows are “no sew” there are no zippers. 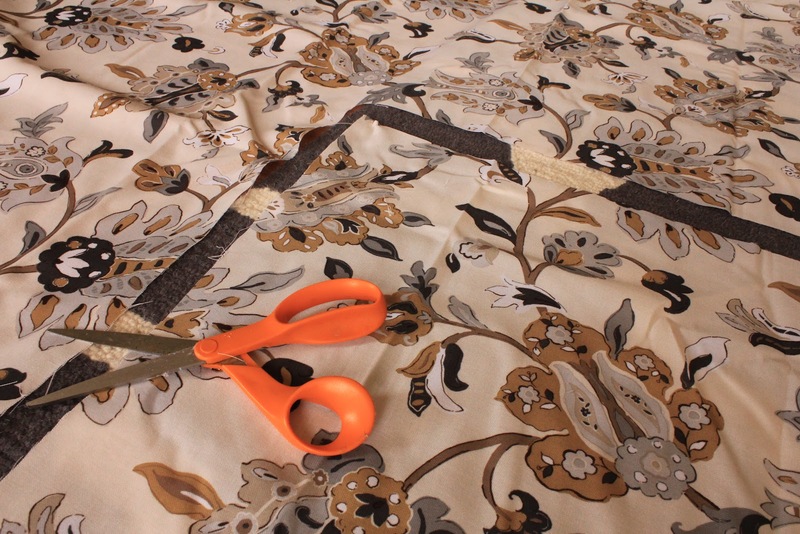 An envelope pocket on the back makes this work, so this means that for each pillow, you will be cutting out three pieces of fabric. 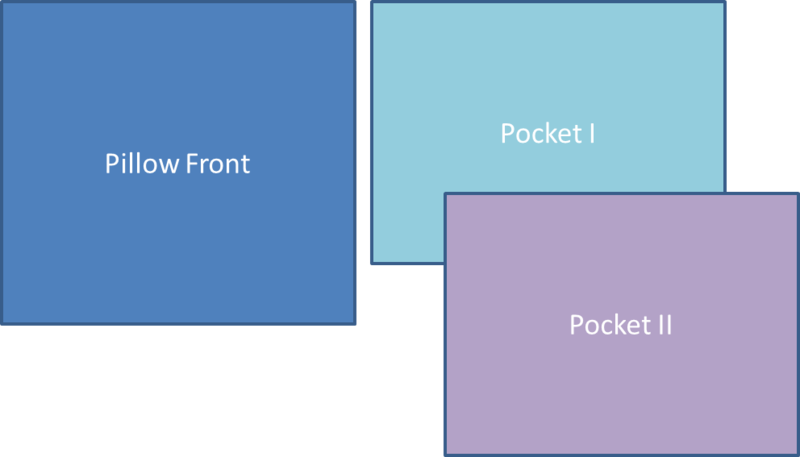 The front panel, and the two back “envelope pocket” panels. 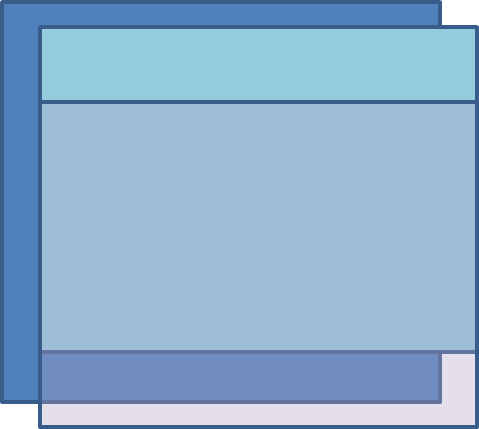 Knowing that my pillow insert measured 20″x20″ I wanted to be sure I cut out plenty of fabric to account for the seams. After messing up my first few pillow covers, I figured out the right measurements to make a tight fit. I learned the hard way that if the pocket pieces aren’t long enough, the fluffy pillow pops out of the pocket (fail) so the key to making this work is having the pocket flaps overlap by at least 8 inches. I like to work in assembly line fashion – cut out all the pieces you’ll need at once, so you can move on to the next step – it’s just faster this way… trust me. 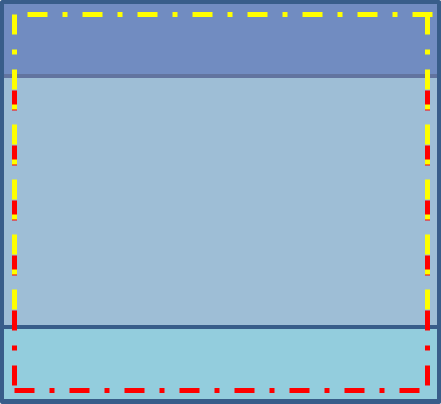 Lay the “front” pattern side up, and lay the first envelope flap on top of it pattern side down (patterns should be facing each other. 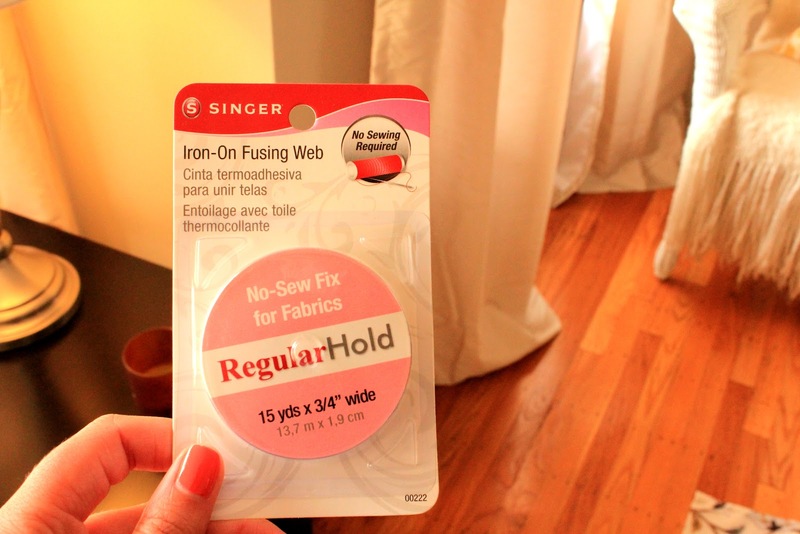 Measure out the fusing web, and place it between the two panels of fabric. Take the damp washcloth, place it over the fabric, and press the hot iron for 20-30 seconds. The combination of the moisture and the heat will make the fusing web melt and bond the fabric. 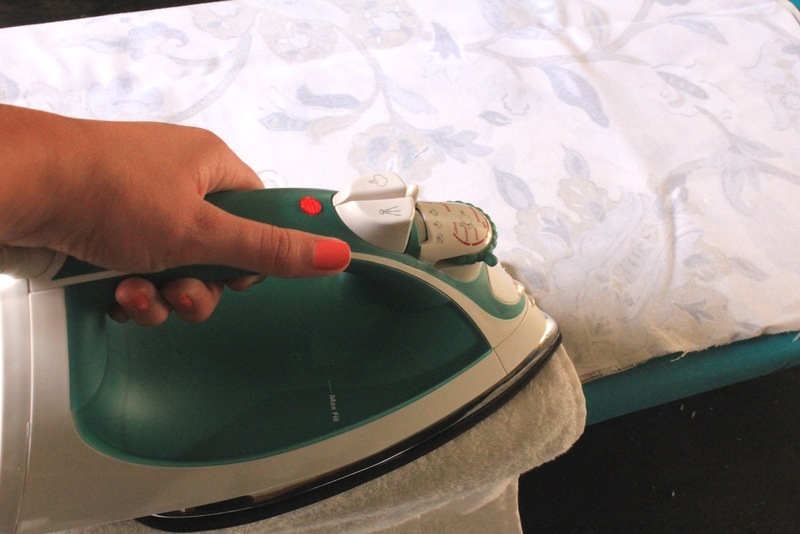 Do not just try to use the steam from the iron – it’s not enough! Once the fusing is done (it takes deceivingly longer than anticipated), let the pillow cool (so the “glue” doesn’t come apart) and carefully flip pattern side out. 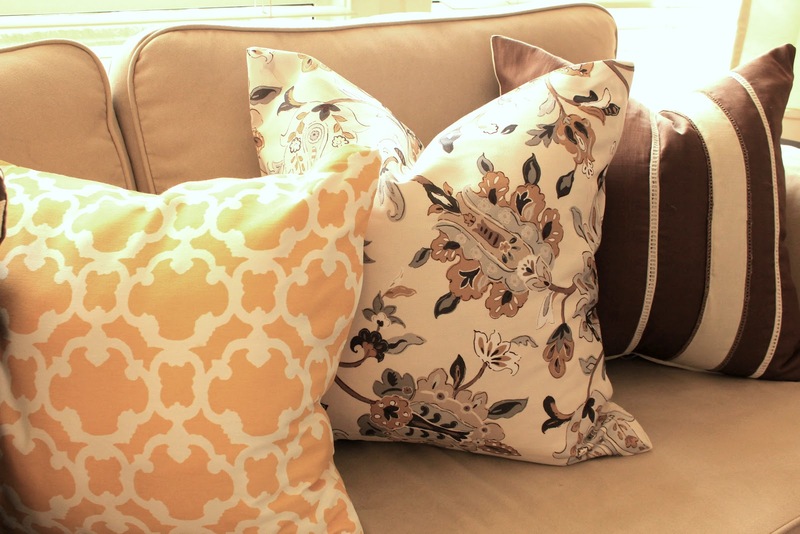 Put the pillow in, and voila… insta throw pillows – no sewing required… they look pretty good! Best shower curtain EVER. This entry was posted in DIY, Home Decor, interior design, our home by Simply Styled. Bookmark the permalink. This is so awesome! I will 100% be putting this to use this fall when I need to change up the colours in our room. 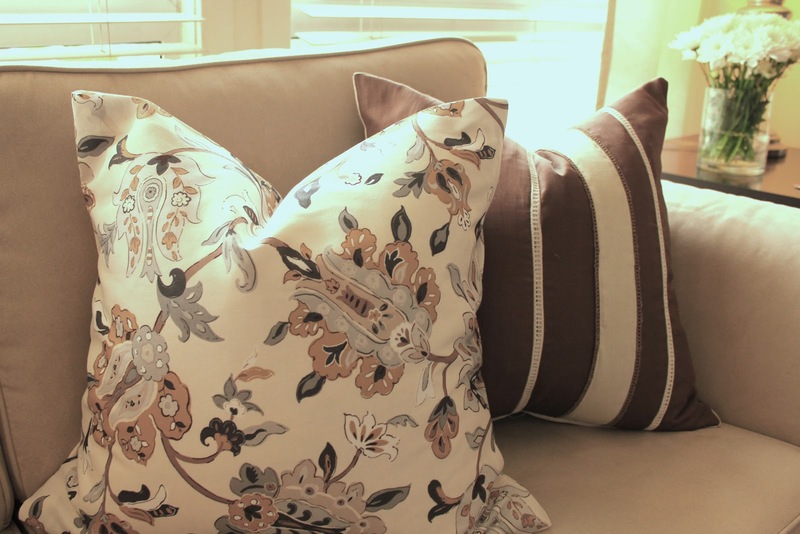 Thanks so much for sharing the tutorial, and your pillows look wonderful! Great work! Love this! Do you know the measurements of your Waverly Santa Maria Desert Flower pillow on your bed? I have that same West Elm chevron duvet and love the look of it with that pillow! Would love to know! ?